India, where it was most likely first used as a dye. of this spice have been slowly revealing themselves over the centuries. health conditions from cancer to Alzheimer’s disease. infections, dysentery, arthritis, jaundice and other liver problems. have always known the magical medicinal powers of turmeric. hot milk for fast recovery of internal injury to body muscles. Turmeric reduces the risk of childhood leukaemia. 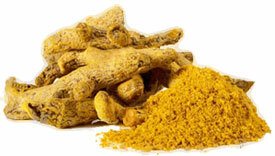 Turmeric has been shown to stop the growth of new blood vessels in tumours. stomach-soothing, and liver-and heart-protecting effects. Laboratory studies indicate that curcumin has anti-cancer activity. determine turmeric benefits as a potential cancer agent. to use it in recipes.